A well-designed landing page is a must for any business. Instead of sending them to your general website (where the might have trouble finding what they’re looking for), you can steer them to a special page that steers them in exactly the direction you want them to take. 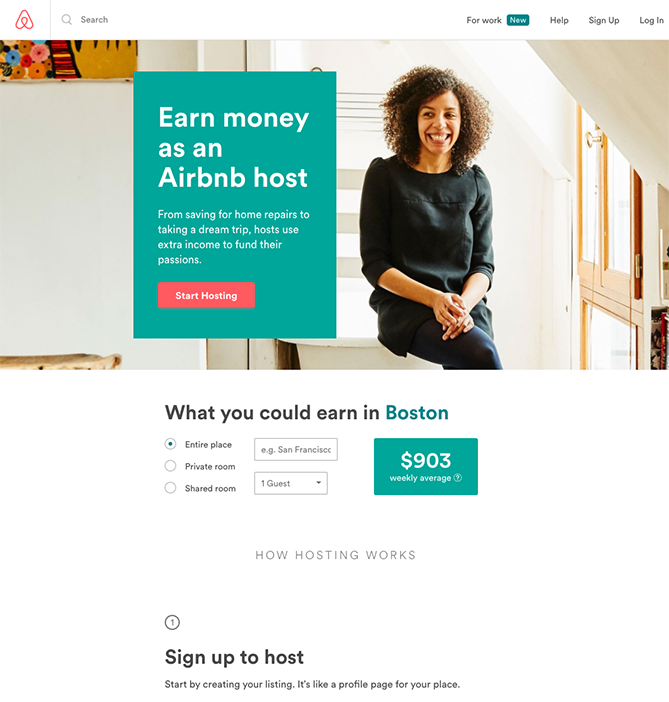 Airbnb has one of the best landing pages in the business, but how many of their prospects are unattended? Much like other tools you have in your marketing arsenal, landing pages need goals. To design specific expectations for your landing page, you need to follow the acronym ‘SMART’. Your goals need to be Specific, Measurable, Attainable, Relevant and Time-Bound. These five measures will allow you to gauge, improve and replicate its success. The goals you set could be based on prior experience, anecdotal evidence or plain hopes and dreams. But Landing pages have a problem. However, even after you put in all this work, you’re likely to come up short. Landing pages are terrible at converting prospects into customers. Emails are quite bad engagement tools. The average landing page conversion is a palsy 2.35%. A quarter of websites on the internet convert at less than 1%. Even the top 25% of websites manage to convert just a smidge above 5%. 5% may seem great, but imagine if 100 people walked into a grocery store and only five people bought a product. You’d run out of business entirely. Imagine if that 10% conversion rate was the best day of your life. So you could treat the symptoms, by changing the size of the text, the color of your site or where the CTA’s are placed. Or you could tackle the actual disease that plagues most modern websites – The lack of conversation. What’s missing from your landing page? Hundreds, if not thousands of interested prospects come to visit your website and sift through your offerings every day. They’re greeted with a barrage of information about how you’re the best in your industry, and how many customers you have. Your customers are on your website for questions, and more accurately, answers. But because they’re on a computer a thousand miles away, one of two things will happen. Build a Chatbot for your business today! This is why websites have such poor conversion rates; Only 2% of your customers have enough information available to them to complete a purchase. It isn’t just how you reach out to your customers that boosts conversion. How long you take plays an important role too. Research by NewBreed shows that when companies take more than five minutes to respond to a lead, their odds of qualifying that lead decreases by 10x. To summarize, landing pages are unengaging, uninformative, slow and inefficient standalone tools for conversion. Take for instance the problem with lead generation. Instead of having people just visit your website, chatbots turn them into interactors. You can use triggers to attract them, entry fields to collect data for lead generation and FAQ’s to answer their queries to improve customer support. Take into consideration some statistics comparing a website with a chatbot enabled vs. one without. A chatbot allows your customer to interact with your website in real time, taking them back to the good old days of grocery shopping. You enter the store with intent, you ask the helpful staff questions and get answers, you have no roadblocks during payment and ten minutes later you’re out of the store. A landing page is an important driver for your revenue. Moz generated an additional $1 million, per year, when they redesigned their landing page and used it to promote one of their core products to their email list subscribers. You can augment your landing page with a chatbot, to generate leads, engage customers, boost conversions and answer customer support queries, 24/7. Make your landing page a better place for business. Free, and in under five minutes.